The 2018 Toyota Camry has been fully redesigned this year, and it’s turning heads from Atlanta to Smyrna thanks to its dynamic new look and capable performance numbers. The new Camry also comes generously equipped with a wide range of standard and available safety features. Delve deeper into packages like Toyota Safety Sense™ P (TSS-P) and the Star Safety System™ with this inside look at the 2018 Camry’s safety features from Marietta Toyota! Standard on every Toyota Camry trim, SSS includes features like an Anti-lock Brake System (ABS), Traction Control (TRAC), Electronic Brake-force Distribution (EBD), and Smart Stop Technology (SST). This standard suite of driver assist features uses sensors, cameras, and automatic mitigation features to help keep drivers aware of what’s around them while also intervening when necessary to avoid or diminish the effects of a collision. Part of the TSS-P package, DRCC automatically brakes and accelerates when cruising at speeds from 0 to 110 mph in order to maintain a safe distance between your vehicle and the one in front of you. When no vehicle is in the vicinity, normal cruise control will resume. Consisting of front, side and rear cameras, this system offers a full view of what’s around the vehicle and also includes helpful parking guidelines on its viewing screen. In addition to DRCC, the TSS-P safety suite also includes a number of additional premium features, including a Pre-Collision System with Pedestrian Detection (PCS w/PD), Lane Departure Alert with Steering Assist (LDA w/SA), and Automatic High Beams (AHB). If you’re looking for even more driver assistance, you can also take advantage of the Blind Spot Monitor with Rear Cross Traffic Alert. Plus, every Camry model gets a standard suite of 10 airbags, as well as a 2-year/25,000-mile ToyotaCare maintenance package for added peace of mind. 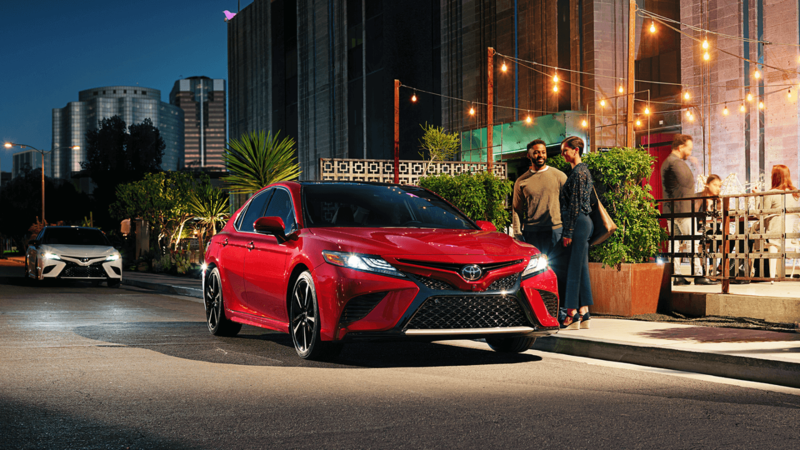 Stay safer on the streets of Smyrna behind the wheel of the fully redesigned Toyota Camry. Atlanta drivers can compare it to the Toyota Corolla or shop this midsize family sedan for sale right now at Marietta Toyota, located at 750 Cobb Parkway S in Marietta, GA. We’re open every day, and you can contact us anytime to schedule your test drive!